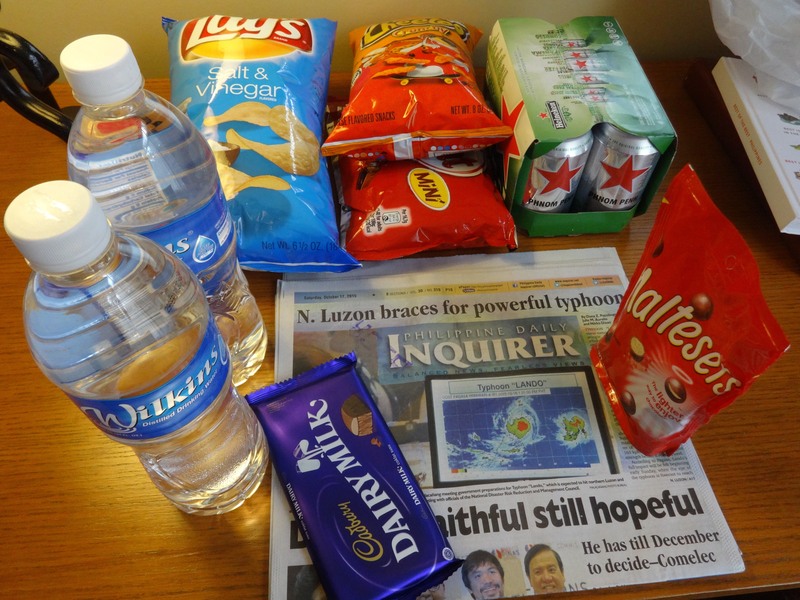 Tag Archives for " Philippines "
my emergency preparations for Lando. Dahlings, I know you’ve all been worried sick about me so I should update you on my little business trip in the Philippines. It turned out that the others who were flying to meet me, bailed on me after looking at the weather alert. 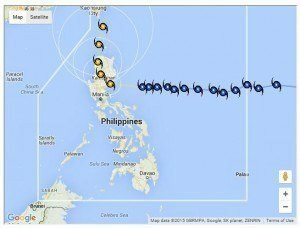 Something about a Super-typhoon being one of the worst ever made them change their mind. So there I was. Jilted at the altar hotel due a major storm heading my way and staying in the city that was projected to be an epicenter for 40+ inches of rain. I naturally called up my local work colleagues as asked I should get back to Manila in order not to be stuck here in the aftermath. “Oh no, it will not be that bad. You should still visit us on Monday. Roads will be driveable on Tuesday.”, they cheerfully said. Being a bit skeptical, I decided to stay since I had come all that way and may as well get something out of it. Decision made: I would have a short meeting on Monday morning and be on the road by lunchtime and even get back 1 day earlier than planned. Saturday I bought a weather jacket and stocked up with essentials in case of power outage in my mini-bar:- see my picture. Saturday night the rain started and on Sunday, the strong winds came. By evening it had stopped. I had survived my first typhoon. Nothing to it. Except it started again Monday morning and got progressively worse. Continue reading..
Dahlings, it seems the only time I read a paper version of a newspaper is when I eat breakfast in hotels. 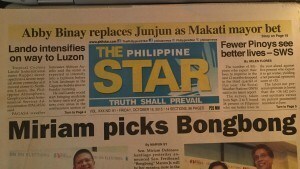 So what did the Philippine Star have to say on Oct 15th while I munched away my cornflakes. 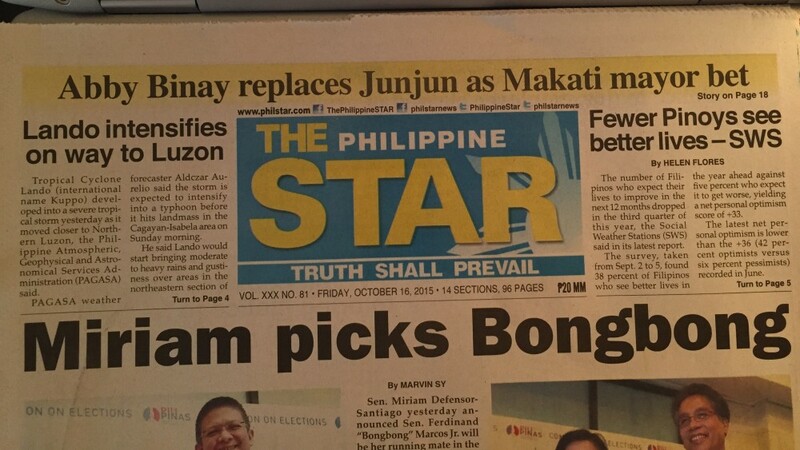 I tittered so over the headline”Mirian picks Bongbong” which is as I said last year, not some reference to some stoner activity but the nickname of someone. Politicians do love their Bongs. Next article, I look up to the top left and spit out my tea. There is a flippin’ Typhon heading towards North Luzon for Monday. Where am I going to be on Monday? 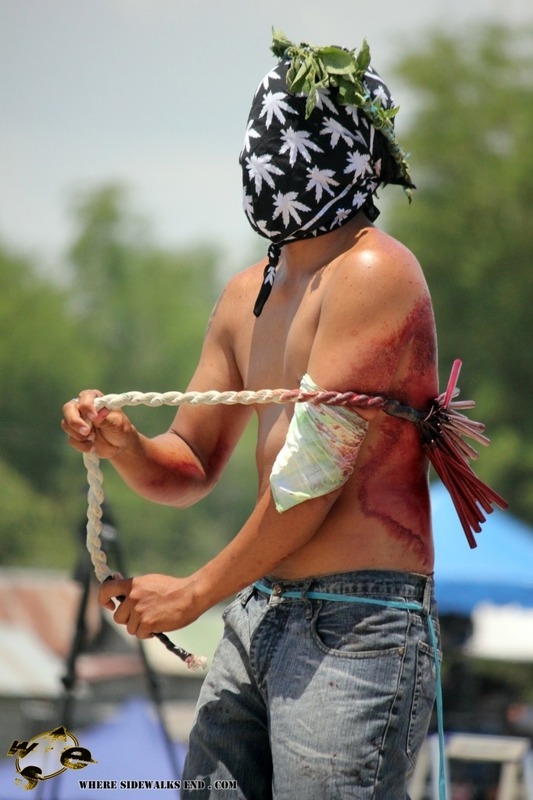 North Luzon. Expecting it to be sunny weather per weather forecast from a few days ago, I haven’t even brought a jacket. Typhoon Lando (international name Koppu) intensified as Public Storm Warning Signal No. 3 was raised over northern Aurora, Quirino, and Isabela, weather service PAGASA. So where is Lando going to make Landfall? Oh crapola, very near me. Not only but it is going to be an usual storm in that it is going to be slow moving and so will dump a lot of rain. Looks like my plans to leave on Tuesday may be in jeopardy as we can expect a lot of damage. Even if I get to Manila, my flight was to going to Taiwan which may get the remains of this in a few days. Oh the joys of travel.